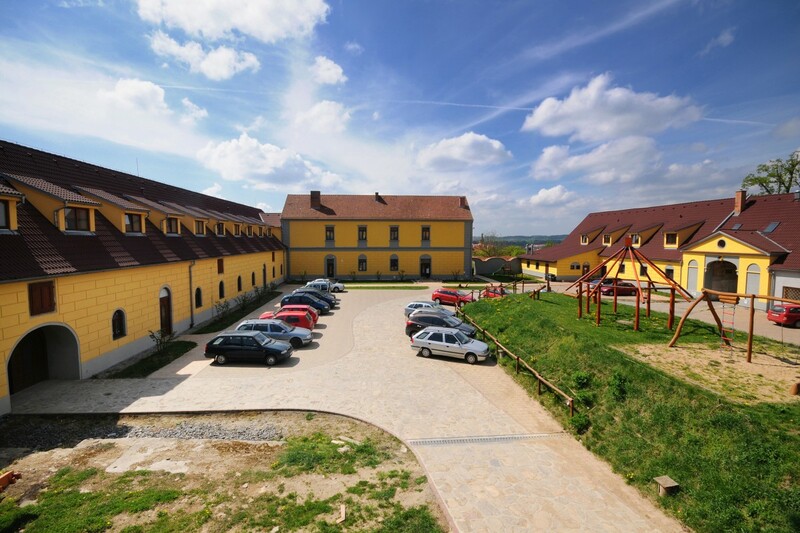 The hotel * * * Restaurant "On the farm” is located outside of the inhabited area on the edge of the town Namest nad Oslavou on top of the hill above picturesque valley of the Oslava river. 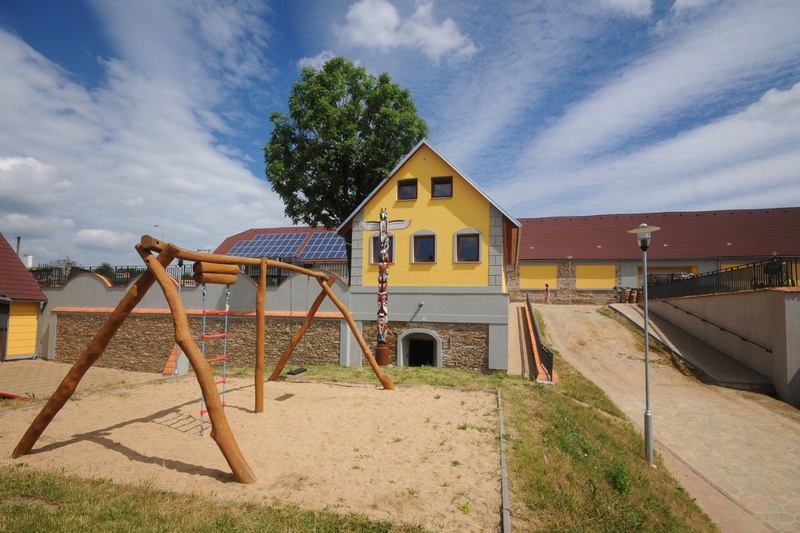 This location enables a beautiful view of the nearby chateau and the city that is situated in the valley of the river but also undisturbed view of the surrounding forests and a beautiful nature of The Bohemian-Moravian Highlands.The entire complex was renovated from a former agricultural farm, which administrated the fields belonging to the owners of the local castle and is situated directly next to the large chateau park. This location offers pleasant and peaceful atmosphere. 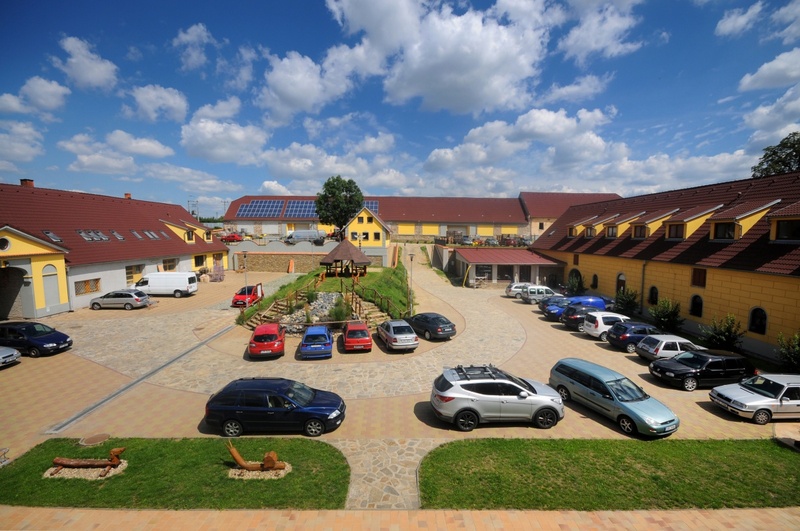 Former horse barn has been renovated into a stylish restaurant, which is serving traditional Czech cuisine and local specialties. Restaurant has a capacity of 70 places. From spring to autumn there is also a sheltered garden with 50 seats. There was made the reconstruction of the attic above the restaurant and two other buildings in the premises behind the restaurant. 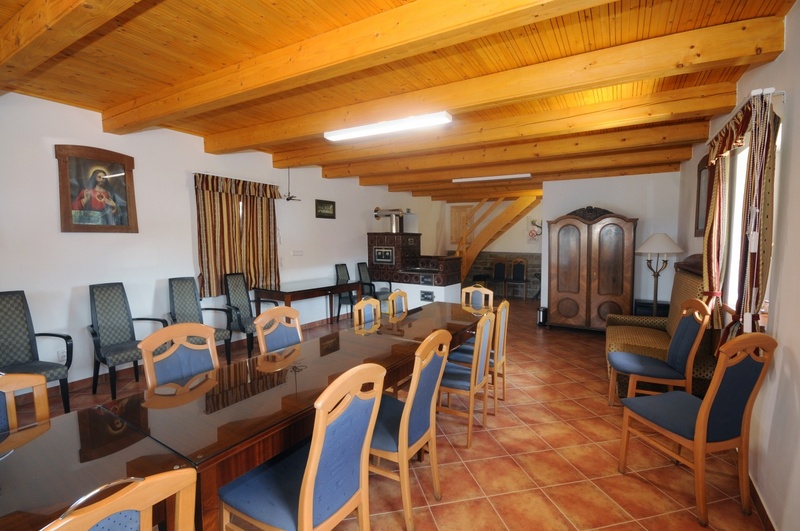 There are available 20 rooms, 2 apartments and a detached studio for guests accommodation. The accommodation capacity is 60 beds: 2 single rooms, 3 double rooms, 6 twin rooms, 7 three-bed rooms, two two-room apartments with 4 and 5 beds and five-bed studio. The price for a room varies according to its equipment. All rooms are equipped with a bathroom with a shower enclosure, a TV and a WI-FI connection for the internet. 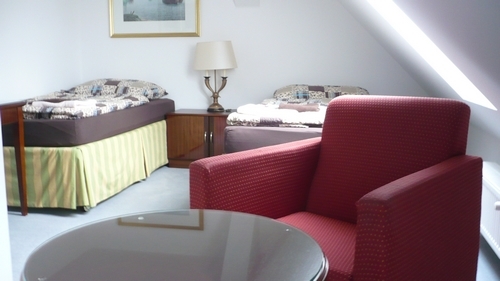 There is a solid internet connection, a hairdryer, a mini-bar and a satellite TV receiver in some rooms. There are personal strong box safes in the reception. There are also two conference rooms. The free parking is available in the closed lighted courtyard. There is also the kids playground in the courtyard. There is the mini zoo farm (goats, piggies, hens, goslings …) in the hotel’s area. Your children can have a fun with the animals. We can offer you a pleasant relaxation in our centre of services: massages, solarium and nail studio. For sports, you can use a mini golf course with certification WMF - World Minigolf Federation. The landscape in the neighborhood is very beautiful - coniferous and mixed forests, meadows, rivers, reservoirs, local lakes and ponds. You can go on the tour of the local baroque chateau, stone bridge with the beautiful statues or walk to the chateau park. There are many options for hiking and biking as well. There is no industry so you can enjoy clean and fresh air. There are mushrooms growing in the surrounding forests. You can go also for fishing and if you are a good fisherman, you can catch yourself a good dinner. In this pleasant environment you can relax, have fun - enjoy your vacation in every kind of weather. The nearby connection to highway D1 allows you to be in Brno in about 30 minutes. There are many things worth seeing in Brno. You can visit Brno Exhibition Centre, The Brno circuit and many more. 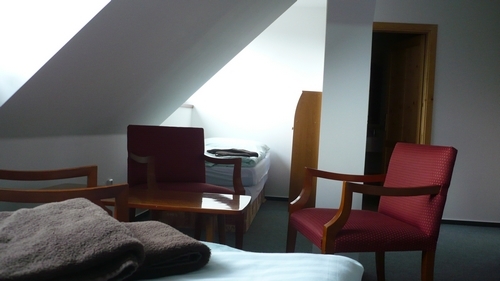 We can offer you a special contract price for a long-term accommodation. All rooms are non-smoking. 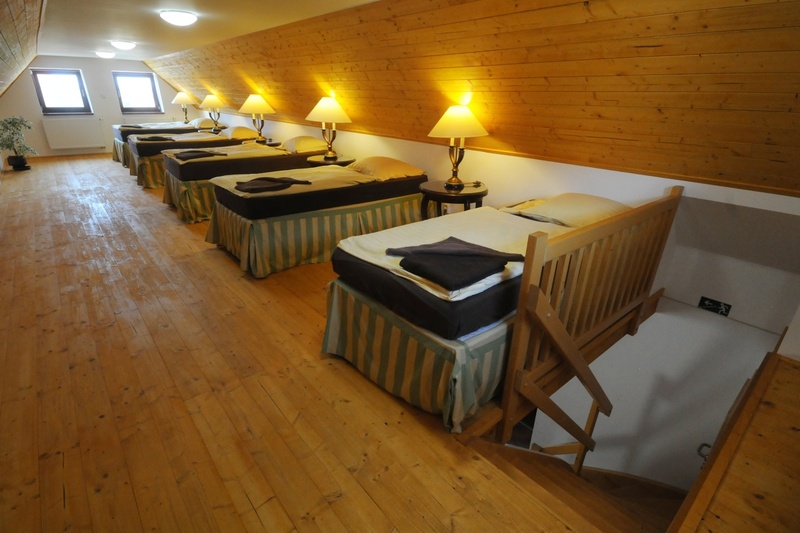 The holiday and accommodation charge is included in the price for the accommodation. All prices are inclusive VAT. The declared size of the rooms is inclusive bathroom. 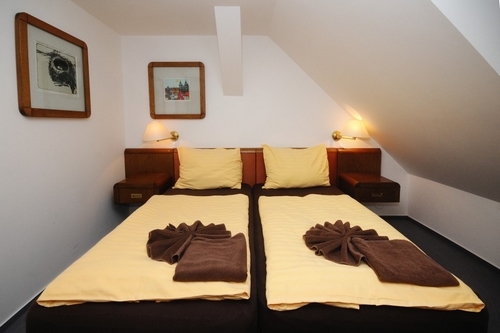 The charge for pets on the room is 100,- CZK per day. The breakfast: 6:30 – 9:30. The price of the breakfast is from 50,- CZK to 85 CZK per day according to the breakfast menu. It is not included in the price for accommodation. 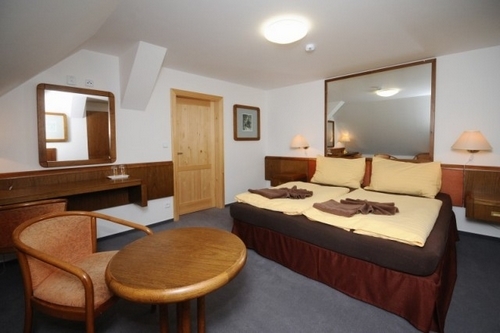 Hotel furniture and room equipment of the type: Mnichov hotel Corinthia. WC and bathroom with shower enclosure, hairdryer, TV, mini-bar, WI-FI, solid internet connection, personal strong box safes in the reception. 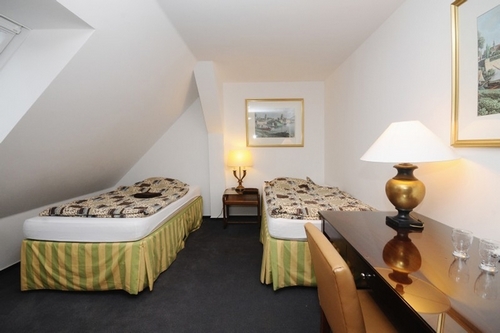 Hotel furniture and room equipment of the type: Frankfurt hotel Mariot, WC and bathroom with shower enclosure, hairdryer, TV, WI-FI, solid internet connection, barrier-free access. Non standard furniture and room equipment, WC and bathroom with shower enclosure, TV, WI-FI, barrier-free access. WC and bathroom (6,60 m2) with shower enclosure, hairdryer, TV with ground signal, mini-bar, WI-FI, solid internet connection, personal strong box safes in the reception. 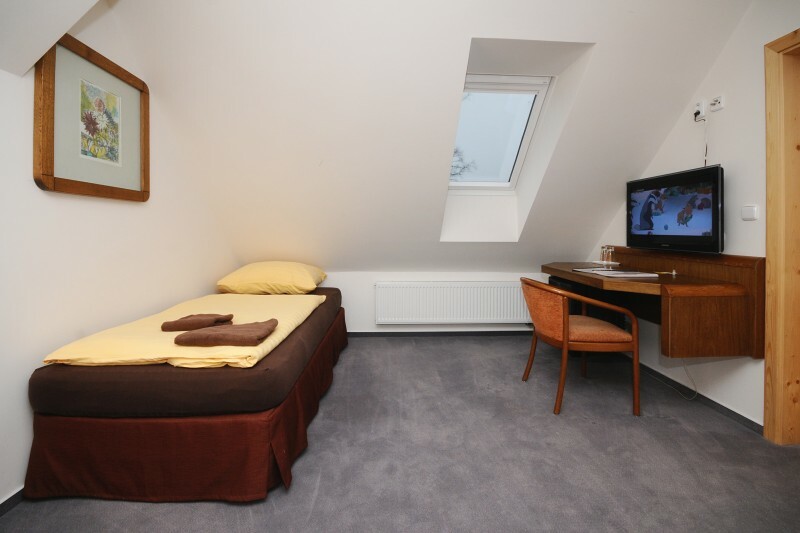 Two rooms, the garden view bedroom - 24,75 m2 – one double bed 190 x 208 cm, the street view room - 16,25 m2 - two single beds 103 x 208 cm, WC and bathroom (6,60 m2) with shower enclosure, hairdryer, TV with ground signal and also satellite TV receiver, mini-bar, WI-FI, solid internet connection, personal strong box safes in the reception. WC and bathroom with shower enclosure (3,30 m2), hairdryer, TV with ground signal, mini-bar, WI-FI, solid internet connection, personal strong box safes in the reception. 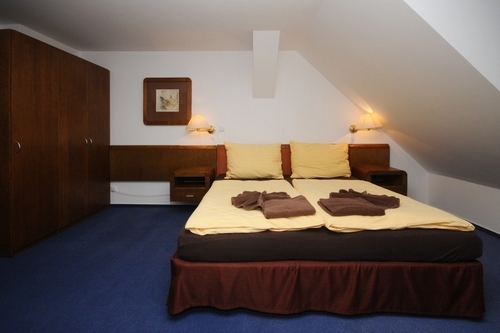 Two rooms, the garden view bedroom - 20 m2 - double bed 190 x 208 cm, the courtyard view room - 26,30 m2 – three single beds 103 x 208 cm, WC and bathroom 3,30 m2 with shower, hairdryer, TV with ground signal and also with satellite TV receiver, mini-bar, WI-FI, solid internet connection, personal strong box safe in the reception. WC + bathroom 3,10 m2 with shower, hairdryer, TV with ground signal, WI-FI. WC + bathroom 6,20 m2 with shower, hairdryer, TV with ground signal, WI-FI, barrier-free access.